Chulalongkorn University Press, 2001, Bangkok. There are more than one hundred gestures, here we show only the more common. Although the Buddha never sat for his portrait, tradition has it that during his lifetime his image was fabricated in sandalwood. Allegedly it was done from memory while the Buddha was preaching to his mother in the Tavatimsa heaven for three months. This refers to the image commissioned by King Udayana. Around the first or second century AD (500 or 600 years after the death of the Buddha), the first images of the Buddha in human form appear in India, and from the beginning these were restricted to a limited number of conventional types. Most were developed in two regions of India at about the same time, namely, Gandhara (present-day Afghanistan), and Mathura (in north central India). It is still a mote point which area should be credited with the innovation. See the extensive research of john and Susan Huntington cited in the Bibliography. Irrespective of which artistic school initially created a portrayal of the Buddha in human form, precise rules soon developed to govern not only the methods of fashioning the images, but also the manner in which the enlightened one could be portrayed. Rendering of his special physical characteristics, monastic attire, and postures and gestures: all became codified. Enabled the elderly sage Asita to recognize the newborn child as one who would attain Buddhahood. 32. Head likes a royal turban (or, the head crowned with a protuberance on top of the skull; the usnisa or unhisa). During the Sukhothai period, the Thai artists returned to the description of the Buddha's personal appearance as given in the Pali texts. To the modern reader, a few may seem curious, perhaps even strange. The late Prof. Alfred Foucher showed that several laksana grew out of a series of misunderstandings of very ancient texts. No matter, eventually all the laksana were given symbolic value, and soon lost their original significance. The artists of Sukhothai saw a deeper spiritual meaning which transcends the mundane world, and which serves to set the Buddha images apart from local portraits. h. 'No display of bones, muscles or veins'. Such similes had long before been adopted by various Indian and Indianizing schools of art as guides to; anatomical form, and it is also noteworthy that virtually the same physical characteristics are used for both Jain images of the Tirtharikaras and Hindu images of divinity. Although the Buddhist sculptor was required to be a faithful copyist and had to reproduce certain features and attitudes that were deemed essential, he was not obliged to duplicate the actual out ward appearance of another image in every detail. The features of the 'supernatural anatomy' were reproduced in essence. The sculptor had to respect certain aspects of the original as far as possible, such as the mode of wearing the robe (either covering both shoulders of leaving the right one hare); and the posture and hand gestures, and in this sense, every image is more or less a copy of an earlier one. In theory, it is a rendering the Buddha's lifetime by an artist who knew him personally. Subsequent artists are alleged to have adhered to a 'memory picture' of this former image, and then by means of intense mental concentration (leading to a kind of trance, samadhi or jnana), they would be able to visualize an image transformed to meet the requirements of the textural descriptions of the Buddha. It was the spiritual significance that really mattered. 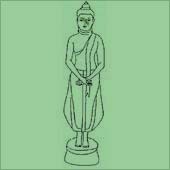 Only four postures (iryapatha) are deemed suitable for a Buddha image: sitting, standing, walking and reclining. c. The Western fashion (pralambanasana), which is the attitude of a person sitting in a chair, both legs pendent. 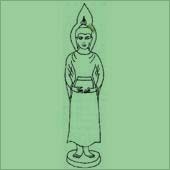 The dress of a Buddha image is the monastic robe. This garment may be worn in the covering mode, namely, draped over both shoulders, or in the open mode, leaving the right shoulder bare. Much later, certain elements of the royal attire were sometimes added, but this will be discussed in due course. The monastic attire is of course an expression of the great humility of the Buddha since its origin were scraps of material used to wrap corpses. In our present democratic age it is difficult to comprehend the extent of the impact that this had upon his contemporaries. As a wealthy prince he had usually been garbed and ornamented with the most-costly attire and decorations, and yet his first monastic robe is said to have been taken from the shroud of a slave girl named Punna. In his exhausted station, he would normally not be closely associated with a female slave, let alone touch the corpse of one. However, with utmost humility and practicality he unwound the burial garment wrapped around the putrid corpse and after washing the material in a river, humbled himself to sew the fabric in a sort of patchwork made up of various shapes and sizes. Now it is the familiar garment worn by most monks in Thailand, but no slaves or corpses are involved; the scraps are cut in odd but traditional shapes from new textiles. The standard orange colour of the material was adopted by the Buddha as signifying the transience of life leading inevitably to death because this was the colour of a shroud. It should be noted that both the Buddha and his followers all adopted identical garb, another indication of humility and democracy exercised by the early sarigha. However, the method of draping and wearing the three pieces (tricivara) varies considerably according to: (a) the climatic conditions and the customs of dress in a particular country; (b) the traditions of different Buddhist sects; and (c) stylistic conventions based on particular artistic interpretation of alleged historical facts. 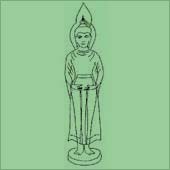 The so-called supernatural characteristics of the Buddha have gradually given rise to a certain number of conventions which evoke these characteristics, such as a conception of diaphanous robes to suggest the energy emanating from the body of the Buddha. The cloth may seem to assume a weightless character. The transparent-like garments are draped carefully in a manner not stressing the physique of a man. In fact, in many depictions, the artisans transcend the differentiation between male and female, so that an asexual portrayal results. Configuration: The Bodhisatttva is seated in the yoga position with the left hand on his lap. His right hand is raised as if to ward off Mara's three daughters. Narrative: There are two interpretations associated with this portrayal. b. While experiencing bliss under the Banyan tree, Mara tempts him to enter at once into Nibbana. He replied that the time had not yet arrived because monks and laymen have not received his teachings and good conduct is not widespread. 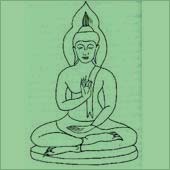 Configuration: The Bodhisattvat is seated in the yoga position with the left hand on his lap, palm up. The right hand rests on the knee and points down to the ground, often slightly touching the earth. This posture is better known as 'calling the Earth to witness'. Known as 'pang man wichai' in Thai, this is a very popular configuration in Thailand. Narrative: Facing east at Bodh Gaya, the Bodhisattva is tempted by Mara and his horde. The demons offer him riches, power, sensual pleasure, etc., but all are scorned and the Buddha continues to contemplate. This conquest of Mara is actually a victory over himself. Configuration: The Bodhisattva sits in the yoga posture with his hands on the lap, the left hand cupping the right one. Eyes are normally closed or concentrating on the tip of the nose. Most figures represented in this position have a beatific expression. Known as 'pang samadhi' in Thailand, this is one of the most popular postures. This beautiful posture (samadhi asara) depicts the heroic and crucial episode when the Bodhisattva struggled to find the cause of suffering and its cessation, and upon discovery how it could be abolished, became a Buddha. The static figure sits cross-legged, both hands lying in the lap, the palms turned upward in the classic yogic mudra. After entering the fourth and lowest stage of absorption (dhyana), a state of painless and joyless equanimity, he achieved bodhi, ultimate enlightenment, or Buddhahood. According to Thai tradition, the meditating Buddha is especially appropriate for people born on Thursday, which, incidentally, is associated with teachers, lawyers and judges. Configuration: The Buddha is portrayed as walking, lifting the right foot slightly from the ground. His left hand at chest level blesses all beings while the right hand sways gracefully at his side. The body reflects the triple-flexed pose (tribhanga or S-curve) which was popular in Indian sculpture. Narrative: The Buddha is going forth to preach his message to others. The active posture is treated as if in slow motion reflecting the careful attention the Buddha paid to every activity. No doubt he is making sure that he is not stepping on any living creature. The artists of the Sukhothai period are often credited with 'inventing' the walking Buddha motif in the round. Although the walking Buddha appeared in Indian sculpture since early times, such depictions were only in relief form. The figure seems to have come to a momentary pause in the course of peregrination. The representation shows one heel raised while the other foot is planted firmly on the ground, and one hand is lifted in the gesture of dispelling fear or giving instruction, while the other arm swings naturally at the side. Configuration: the Buddha stands upright with both palms raised, as if pushing something away. 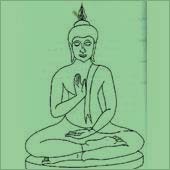 It is not to be confused with the gesture of H below, 'Descent from Tavatimsa heaven' with a double vitarka mudra. Narrative: In Thailand this is known also as 'Stopping the ocean from rising' although the episode concerns a flood at an sahram located on a river bank in India. The Buddha went to the camp of Kasyapa who had a following of one thousand 'fire-worshippers'. When he asked to stay over-night, he was given a meagre hut on the bank of a flooding river. To prevent this, the Buddha miraculously stopped the water, causing it to subside and thereby converted Kasyapa and his followers. Thus this configuration is known in Thailand as 'causing the waters to subside; stilling the river; and calming the ocean'. 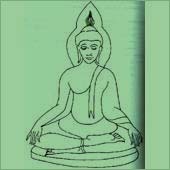 Abhaya mujdra with both hands, the gesture used by the Buddha in curbing the flood, is referred to in Thai as 'ham samut' and has become symbolic of the Buddha's mastery over the passions. Configuration: The Buddha stands in an erect manner with both hands holding alms bowl at his waist. Narrative: This configuration signifies the first morning at Kapilavastu after visiting this father's palace, In the early morning the Buddha went the on the alms round, collecting food from his father's subjects. His own relatives had made preparations for receiving him at the Nigrodharama. When they left him the evening before, none of them had asked him to breakfast with them. So in the morning he went out himself to collect alms in the city. Configuration: In cautioning his relatives, the Buddha is depicted as standing with his right hand in abhayamudra. The left arm falls to the side, gently touching the robe. Narrative: This episode occurred when the Buddha descended from the Tavatisma heaven after an absence of three months. He stopped his relatives from fighting over the water rights of a river flowing between their properties. Relatives of his father and mother were obliged to compromise and share the resource. He, therefore, mediated between his own relatives to desist from their former antagonisms. Configuration: A standing Buddha raises his left hand to prevent a sandalwood image of himself room approaching. The right arm is pendent alongside the body. A spectacular representation of this may be seen at the Phutthamonton Park in Nakhon Pathom province where the gesture is combined with the walking attitude. Another impressive depiction from the capital of Ayutthaya is housed in the east wihan at Wat Po in Bangkok. Cautioning the sandalwood image' is referred to in Thai as 'ham phra kaen chan'. Narrative: This represents a curious legend subsequent to the Buddha's preaching to his mother for three months in Tavatimsa heaven (an area on the summit of Mont Meru at the centre of the universe where dwell the thirty-three gods who are responsible for man's welfare. While the Buddha was away from earth, King Udayana had a sandalwood replica made of him and placed it upon his customary seat within a large hall in the Jetavana Garden at Sravasti. When the Buddha returned, the wooden image miraculously greeted him. The Buddha halted the statue with his left hand and requested that it return to the podium and thereby serves as a model for other representations to be fashioned after his demise. 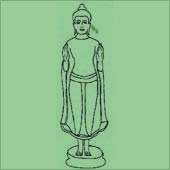 Configuration: The Buddha stands, both arms pendent alongside the body. The eyes are downcast. Narrative: The Buddha stands quietly before going out. This reflects that he has complete awareness of what he is doing. Configuration: The Buddha gestures with his right hand at his chest, as if beckoning rain to come. The left hand is cupped to hold water from the expected shower. Variants: The Buddha may be represented as either seated or standing making the abovementioned gestures with his hands the drapery may imitate the Gandhara style of northwestern India. King Rama I decreed that his type of seated image should be created, and since the Bangkok period a statue in this pose has been carried in procession during the ploughing festival in mid-May. Narrative: King Rama V decreed The Standing variant whereas King Rama I initiated the seated version. 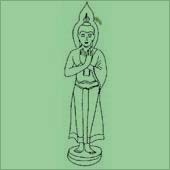 If standing, his right hand is in the vitarka mudra of instruction, the left hand cupped as if to accept a donation. The monastic robe is treated in a symmetrical rippled fashion imitative of the Gandhara School of art in northwestern India. 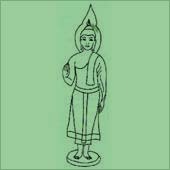 The feet are placed in a realistic pose, less formal than other figure characteistic of the early periods of Thai sculpture. This pose was popular during the Dvaravati (Mon) period. If seated cross-legged, the left hand is raised in the position of calling and the right hand is ready to receive water. 00: The Buddha is seated in the 'closed lotus position' so that the soles of both feet are visible. The legs are crossed tightly and the hands rest in the lap. This mode was popular in the northern school (Lan Na) of Thai art and is especially found in images made around Chiangsaen. Configuration: The Buddha sits in the 'open lotus' or relaxed position. Both hands are placed on the knees, palm down. Narration: During the final year of his life, the Buddha stopped at Veluvana (a grove on Rajagriha-'Vultures's peak'-donated by King Bimbisara) during the rainy season (Buddhist Lent). Although seriously ill at the age of eighty, he was able to endure his illness with heroic patience. He used this experience as a theme for preaching about the transience of life. He explained the law of old ages to Ananda, describing his 'body (as) a cart that must be repaired with bamboo, and bundled up with thongs' to emphases the blunt truth that sickness, old age and death are inevitable for all existent things. 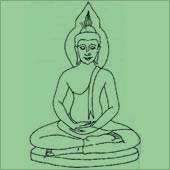 Configuration: The Buddha lies on his right side, using his right hand both feet is parallel, arranged in a symmetrical manner. The right shoulder normally rests on a pillow. The monastic robe is worn in the traditional ' open mode' with right arm exposed. The covered left arm and flat hand are parallel to the left flank. A magnificent example of this theme may be seen at Wat Po (in the northwest wihan). Narrative: In Indian tradition, this is the Mahaparinibbana, or final entering into nibbana and it brings the Buddha's earthly career to an end. 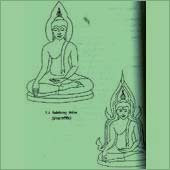 However, in Thailand after the Sukhothai period, the same posture is considered to indicate the Buddha as merely resting and it is designated as 'Phra Phuttha Saiyat', which describes the Buddha's recumbent position. 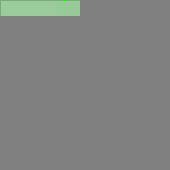 According to Indian standards, the depiction of the figure is supposed to be the same as for a standing image, although seen horizontally. This accounts for the 'flying ends' of the monastic robes that assume a transcendental quality. Reclining figures may have the footloose decorated with 108 auspicious marks, adhering to the Pali canonical list of items (laksana) which pertain to the Buddha as a transcendental Universal Ruler. Configuration: a large serpent that's five shelters The Buddha or seven-headed crest is raised above his head and shoulders. The coils of the serpent's body are treated as a platform on which the Buddha is portrayed as deeply meditating. Variant: Literal readings of the story have led some artists to depict the coils of the serpent's body wrapped around the person of the Buddha with only his head visible. The iconography was a favorite theme of Khmer and Burmese art, examples of, which are also prevalent in central Thailand. It was rarely depicted in India: and Sukhothai craftsmen in Thailand have tended t o avoids the posture since the fourteenth century. It is called 'phra nak prok' in Thai. 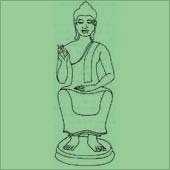 Configuration: The Buddha is seated in the yoga position, his hands in the mudra of instruction. Variants: There are up to four variants, wherein the Buddha uses one or both hands. a. He may be depicted with the left hand in the lap and the right hand brought to the chest in vitarka position, namely, the thumb and index fingers joined while the other three fingers curl slightly out wards. b. 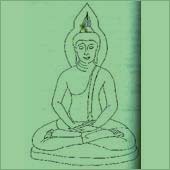 He may be shown in the dhammacakra mudra, 'turning the wheel of the law', representative of the first sermon to the five disciples. c. He may simply sit quietly in meditation. His friend Kondanna (Pali: Kontanya) gladly received this teaching and in turn eventually convinced the four others, namely: Vappa Bhuddiya. Mahanana and Assaji. 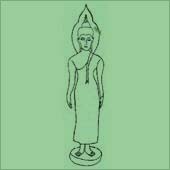 Configuration: The Buddha may be shown seated in t he Western mode with legs apart, the left hand in the lap, and the right hand raised at the chest level in the vitarka mudra of instruction, the thumb and index fingers joined while the other three fingers are slightly cupped. A lotus base is at his feet. 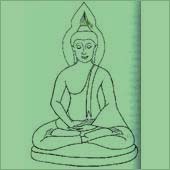 Variant: the Buddha may be portrayed as standing. 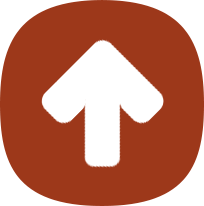 Narrative: The miracle at Sravasti is a demonstration of power to nonbelievers. The Buddha displayed his celestial aura and revealed himself in glorified form. Earthquakes and storms with thunder and lightning accompanied the visionary spectacle. 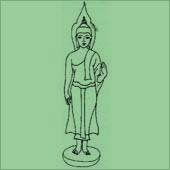 On the occasion of the great miracle the Buddha made relics of himself, the so-called 'Double Apparition'. The miracle was intended to convince skeptics of heterodox religious sects. Configuration: The Buddha is bedecked with jewelry and attributes of royalty, including a crown. Variants: a. 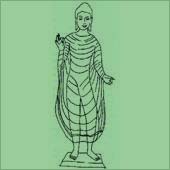 The Buddha may be standing, his hands portrayed in double abhaya mudra similar to 'holding back the waters' or he may have only the right hand in abhaya mudra, leaving the left arm pendent. b. The Buddha may be seated in either of the abovementioned attitudes. The clue to the portrayal is that the Buddha is bedecked in royal attire. Narrative: The Buddha was requested by his patron King Bimbisara to assist him when he was threatened by King Jambupati of a neighboring realm. Standing in a bamboo forest the Enlightened One observed this invasion of Bimbisara's kingdom and so manifested himself in full regalia as an expression of beneficent powers. Eventually King Jambupati also became his disciple and did not infringe upon King Bimbisara's territory. This manner of depiction the Buddha developed toward the end of the sixteenth century as the art of Ayutthaya became increasingly ornamental. Such emphasis on decorative finery tends to be rather detrimental to both sculptural and religious considerations. However, a possible explanation for the trend is that after the physique and silhouette of the figure hand become somewhat stiff and stereotyped, artisans felt a need to elaborate and beautify the simplified form. When observed in detail, there is an exquisite intricacy of fine design is such elaboration, but the overall bejeweled appearance tends to become superfluous. Comparable use of royal regalia to enhance divine personages and objects may be found in many religious traditions (e.g., Roman Catholicism and Greek and Russian Orthodoxy). In this instance, at the beginning the regal attributes were limited to head and crown, but eventually were sumptuously applied to cover the entire body. When the Buddha is represented in this attire, the garb may be depicted in two different ways: ornaments are either superimposed over the monastic robes, or he may be represented as a prince. Several famous Buddha images of Thailand are depicted in royal attire, wearing a crown, jewelry, royal robes and other accessories (In Thai, 'Phra Phutha song khruang'). A practical reason may be the fact that craftsmen intended to imitate real gems and silk scarves with which devotees frequently adorn images. One particular example, among others, is the so-called 'Emerald Buddha' at Wat Phra Keo in Bangkok. Several other explanations concerning the origin of this iconography have been suggested by eminent art historians, such as the late Prof. Paul Mus and his colleague, Prof. Benjamin Rowland, among others. 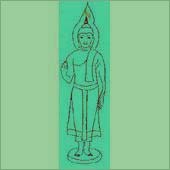 Although these scholars were mostly concerned with Indian sources and development of the motif within a Mahayana context, perhaps in the Thai Theravadin tradition the most plausible source is the legend of King Jambupati. Configuration: The Buddha stands with his right hand placed over the left on the upper thigh in a mindful attitude. Narrative: The first posture of the Buddha after his enlightenment depicts him as sitting under the bodhi tree for seven days to rejoice in the bliss of release from mundane preoccupations. After that, he stepped to the northeast of the tree and stood still to look at the tree without blinking for seven days. During this time is said to have considered the suffering of all living things, including the tree. Configuration: The Buddha stands with the left hand hanging down at the side while the right is raised at chest level; the palm faces outward to depict a gesture which indicates prevention of evil. Narrative: Once there was no rain in the city of Vesali in the Vacchi region of India. No paddy shoots were in the fields. Famine spread over the land. Both industrious and lazy men died of starvation and their bodies lay on the roads and floated in the river. The city became so polluted that a great many people died of cholera. Demons crept into the city and devoured the dead bodies, which were scattered everywhere. Emboldened by this gruesome nourishment, they began to taste the decomposed flesh of patients and to such blood from unclean people. Thus the people of Vesali encountered three evils: poverty, cholera and devils. Some were impelled to migrate to other towns. The king of Vesali was alleged to be the cause of these entire unfortunate events because of committing actions contrary to royal custom. But although officials were assigned by the king himself to detect any wrong doing, no inadequacies were found. In desolation, the remaining people could only continue to propitiate gods and sorcerers and beg for help from any directions. Hearing this, the king nominated a committee to pay tribute to King Bumbisara and request him consent to invited the Buddha to be a guest of Vesali for there days in the evils. Both King Bimbisara and the Buddha agreed to the invitation, pausing only to allow time for the king to seek the best route and erect pavilions along the way. The journey took five days. In the company of the Buddha and 500 monks, the devout king of Rajagriha accompanied the party to the Khong Kha River and, wading into the water until only his head could be seen, helped send the royal barge to Vesali. Upon arrival there, the Buddha received an equally warm welcome from the king, who escorted him on a three-day foot journey to he Capital City. Coming to Vesali, the Buddha stood still and looked steadily at the sky and recollected the transcendental virtues he had achieved during his countless existences. As a result, huge clouds formed at the west and flashed, and rain poured heavily, as if nature itself intended to clean the surface of the earth. The pounding rain filled up the canals so that the city became completely flooded and the dead bodies of both human beings and animals scattered on the ground ere washed out to sea. When it stopped raining, the land was clean and the air fresh. That evening, the Buddha requested his disciple Ananda to study the Tipitika and wander about the city reciting portions from it so as to dispel all calamities. Accompanied by the king and his escorts, Ananda did this, holding the Buddha's alms bowl brimming with water, and sprinkling the lustral water around the city. All human beings suffering from devils and fatal diseases were healed when drops of the water fell upon then. They assembled together and followed the venerable monk, praising the Buddha for his merits. All devils persecuting humans were frightened and many fled from the city. Other concealed themselves between walls and doors of houses, but when drops of the sacred water touched them, they felt a sharp pain, as when a dog is struck on its back with. In great distress, all of them hurried to the city gate where, impatient to allow others to escape, many crushed each other as they rushed out of the city. Others tumbled over the city wall and fled without looking back. After this, the monk led the people to the Buddha who outlined his teaching; he offered a sermon starting from the beginning, the cause of all suffering and ending with a proclamation of the four Noble Truths. The people were full of joy and devotion; most for seven days and aware that three perils had been completely eradicated and that all people were happy, the Buddha bid farewell to the king and returned to Rajagriha. Configuration: The Buddha is depicted as lying on his right side. The left leg rests on the right. The left arm lies along the body. The right arm serves as a pillow and the palm of the right hand supports his head. Narrative: When the Buddha visited and ashram is Sravasti, a certain Asurindarahu, an important figure in the kingdom of giants, eagerly desired to have and audience with the great teacher. However, being proud of his status as a giant, he did not want to bow his head to the Buddha and thus made up his mind not to do so. In meditation the Buddha divined the giant's presumption. He instructed Ananda, 'Today, I am expecting Asurindarahu. The giant, the only one who could perceive this mirage, was greatly astounded to observe that the size of the Buddha's feet was larger than his own body. Instead of bending over the Buddha, he admiringly appreciated the benign perfection of the Buddha and graciously glorified him. The Buddha cordially preached to him, 'Naturally, one should not presume the truth of any rumor without prior consideration. You are correct that you are larger than other beings in your own kingdom. But have your ever thought that those outside your kingdom might be larger than you? It is like a big fish in a swamp thinking that he is the largest because he never knows of nay-grander existence in the ocean. Asurindarahu, all angels in the upper heaven are larger than you. If you would like to see them, I can conduct our to their heaven'. When the Buddha appeared in the realm of angels, myriad of them were in attendance. Realizing that their form was a hundred, even a thousand, times larger than his, yet smaller than that of the Buddha, Asurindarahu trembled with fear and hid himself behind the Buddha, like a spider clinging to the hem of his robes. The god Brahma asked the Buddha what king of animal he had brought with him. The Buddha replied that it was Asurindarahu, who had been proud about his large body and had reckoned that no one was as large as he, brought here to witness those who were actually larger in form. He remarked that the giant tended to be obsessed with self-esteem and to display scornful contempt for others. This, he said, is like a distressed man having only one coin believing that he is rich or an uneducated man who is arrogant of his limited intelligence. After staying awhile in Brahama's heaven, the Buddha brought Asurindarahu back. The giant was in complete compliance with the Buddha and made an obeisance before cleaving for his won kingdom. Configuration: The Buddha is standing with heels pressed together as he holds an alms bowl with both hands at the waist. Narrative: When the Buddha visited Kapilavastu, it was the first time that he demonstrated his divine powers in public. This was done during a sermon, by soaring through the air, creating bright red rain which only soaks wicked persons, and citing portions of the Wessandon Jataka (the last of a series of stories which are tales of the former births of the Buddha). After the Buddha had finished his sermon, all of his relatives, led by his father King Suddhodhana, expressed their highest respect before returning home. However, his father and courtiers made a mistake in assuming that next morning the Buddha would come to the royal palace for breakfast. No one actually invited him to return the following day, although the royal caterers prepared a wonderful meal for his benefit. Instead, since no invitation had been given, the Buddha and his followers went out to the main road and relied on the people of the city for sustenance. It was the first time that the people of Kapilavastu were privileged to see the Buddha carry an alms bowl and permit devotees to give him food. Note: Traditionally, monks do not ask for anything. It is the practice in Buddhist countries for devotees to offer food and other things to them. Usually, a monk carries an alms bowl no his morning excursion and devotees stop him with respect and give him food in the bowl. Then he goes forth to collect additional alms. Configuration: The Buddha sits in the Western mode, the left palms on the thigh and the right hands on the knee. He is about to accept a honeycomb from a monkey and a water pot from an elephant. A well-known Bangkok period representation of this theme may be seen at the northern wihan at Wat Po in Bangkok. Narrative: When the disciples were quarreling among themselves in Kosambi, the Buddha sought sanctuary in a peaceful forest. Here the elephant and monkey brought him refreshment (Water and a honeycomb). The Buddha with elephant and monkey, generally entitled Phra Phuttha Palalai, may also be called Phra Phuttha Palilaika in reference to the elephant of the jungle, which is Parileyyaka (Palilayaka) where the Buddha resided after he left Kosambi. The episode is a story showing that the Buddha's needs were taken care of by even members of the animal kingdom. He accepts the water pot donated by the elephant at his right, the position of highest honor, and a smaller monkey is placed at his left, presenting a bee's nest. Configuration: The Buddha sits cross-legged in the meditation posture, placing both palms upward on the lap, the right over the left. Narrative: When the Buddha, seated under the bodhi tree, had overcome all temptations and unwholesome thoughts barring the way to enlightenment, he was desirous of practicing meditation at a higher level. Gradually, he entered the four levels of meditation. During the first watch of the night (18-21 hours), he was able to recall all his former incarnations. During the middle watch (from 21 hrs. to midnight), he possessed divine insight and had knowledge concerning to birth and death of human beings and animals, and saw then leaving one world and being reborn in another. Using his divine intelligence, he conquered craving at the final watch (from midnight to 3 hours) and continued considering the cycle of dependent origination, and the nature of despondency and craving, until he achieved enlightenment at dawn. Once freed from craving, an earthquake occurred and a profusion of blooms appeared. All gods welcomed the arrival of an enlightened Buddha and strewed garlands in his honor. Configuration: the Buddha stands or sits in the pose of contemplation, both hands held at the chest, the right palm over the left. Narrative: After a visit and obeisance of two merchants named Tapussa and Bhalika, the Buddha contemplated on the subtle nature of the dhamma. This contemplation resulted in his intention to expound his teaching to mankind. Knowing the reluctance of the Buddha to hold back from entering nibbana in order to teach Brahma alerted all the gods and urged them to have an audience with the Buddha and beg him to expound the dhamma to perceptive people. The Buddha recalled the graciousness of former Buddha's who, after their enlightenment, had postponed their nibbana to preach. He also foresaw that there would be many that could understand him and he also realized that people have different levels of intelligence and perception. Some could succeed through the teaching and attain enlightenment. Some could easily comprehend the dhamma, while others could not. Like the lotus growing in water, some are buried under the water, some rise to he surface, others are far above it. Those who rise above the surface, he thought, are like the lotus in full bloom. Those at the surface may be in bloom tomorrow, and those buried underneath, on the following day. These stages of the flowering lotus are likened to teachable and untouchable persons who can easily, with difficulty, or never achieve enlightenment. Thus, through understanding, he realized that the dhamma would be of vital benefit to teachable persons. The Buddha, there fore, was determined to expound the teaching to mankind for its future benefit. Configuration: The Buddha sits in meditation with overlapping hands turned upwards on his lap, while the naga spreads its hood above his head. There are two modes for this posture: in one the Buddha sits on the serpent's coiled body, while the other shows the naga encircling the lower part of the body up to the shoulders to protect the Buddha from wind and rain. The former is the most popular version. Narrative: After seven days of meditating under a tree near the bodhi tree, Mucalinda, the king of the naga that also protected him with the hood, encircled the Buddha's body. According to legend, the Buddha's body except the head, neck and shoulders was coiled four or five times by the naga to protect him from a storm. 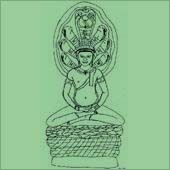 Consequently, the Buddha image is depicted as if the Buddha is sitting on the coils of the naga that fans his crest like a hood. When the rain stopped, Mucalinda uncoiled himself and disguised himself as a young man and paid respect to the Buddha. Afterwards, the Buddha pronounced that the person who realizes the truths of life, being self-controlled, released from all passions, and unattached to existence, would be the happiest of all creatures.